Harpin’ By The Sea is all about the 10 hole, Richter tuned, diatonic harmonica. That’s the blues, 10 hole, or short harp to most of us. If you have a Chromatic, Tremolo, or Octave style harmonica, by all means bring it along, but you will need to invest in a 10 hole, Richter tuned, diatonic harp to participate in our workshops. An example is pictured here. Not sure where to get one? There will be a trade stand at the event, run by Hobgoblin Music, selling discounted diatonic harps. You can pick one up on the day if necessary. In a nutshell we’re Bob Dylan rather than Larry Adler, but if you’re still unclear, that’s absolutely fine – give us a quick call and we’ll be happy to explain. Or visit www.harpsurgery.com. Either way, don’t let any of this prevent you from coming and enjoying a whole new world of music making. You will need a 10 hole diatonic harmonica in the key of C Major. The letter C will be stamped on the cover plate or on the side of your harmonica. You should bring a small set of 10 hole diatonic harps, including the keys of C, A, D and G Major. 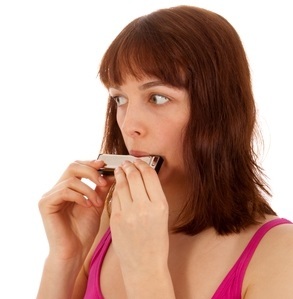 You will not be able to follow the full programme armed with only one harmonica. You should bring your full set of 10 hole diatonic harmonicas in a standard selection of Major keys. Other tunings are also welcome, however these are in addition to the core Major keys. You will not be able to follow the full programme armed with only one harmonica. You are welcome to bring drinks, fruit and light snacks into our workshops, however picnic lunches (sandwiches etc) cannot be consumed on site. Please help us return empty glasses and china to the bar when your workshop is finished and dispose of any litter sensibly. Do also be aware that eating, drinking and harmonica playing are not the best of bedfellows – food particles and sticky saliva can clog reeds and create unwelcome surprises!